Nearly effortless way to protect your rubber and plastics. specialized formula penetrates deep into plastic and rubber surfaces. Dry satin shine that can be layered to increase gloss. BLACKFIRE Trim & Tire Protectant provides a fast and nearly effortless way to protect your rubber and plastics. Utilizing a specialized formula to penetrate deep into plastic and rubber surfaces, BLACKFIRE Trim & Tire Protectant revives old, faded trim to a fresh, protected satin finish. 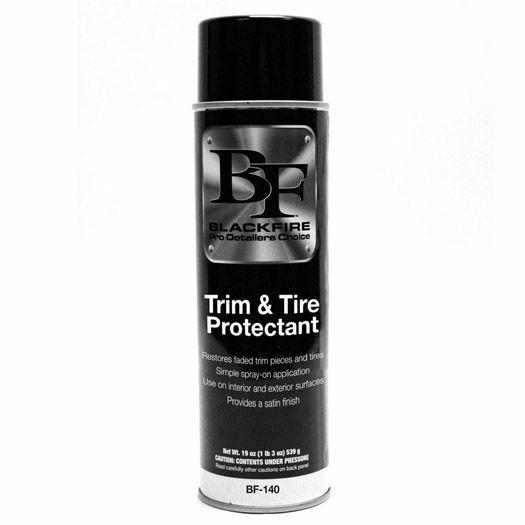 BLACKFIRE Trim & Tire Protectant�s simple spray on, walk away formula is the perfect fit for any detailer! Trim and tires are some of the most problematic areas of your vehicle. Between constant UV abuse and dirt continually embedding into its porous surface, it can cause quite the headache to keep your tires and trim looking it�s best. BLACKFIRE seized this opportunity to create a simple, yet effective way to care for pesky plastics and troubled rubber. BLACKFIRE�s proprietary formula penetrates deep into the material to create a barricade against unwanted contamination. This is achieved by blocking the pores of the plastic; locking in moisture and blocking out unwanted contamination. BLACKFIRE Trim & Tire Protectant isn�t limited to tire and trim, the simple application of BLACKFIRE Trim & Tire Protectant will revolutionize the way you protect the plastics under your hood. The aerosol delivery method will put protection where you need it, even if you can�t reach it! You won�t have to worry about a greasy shine either. BLACKFIRE Trim & Tire Protectant provides a nice, dry satin shine and can be layered to increase gloss! Simplify the way you care for you rubber and trim with BLACKFIRE Trim & Tire Protectant! Spray a thin, even layer directly onto the surface and allow to dry. Buff off excess if desired.